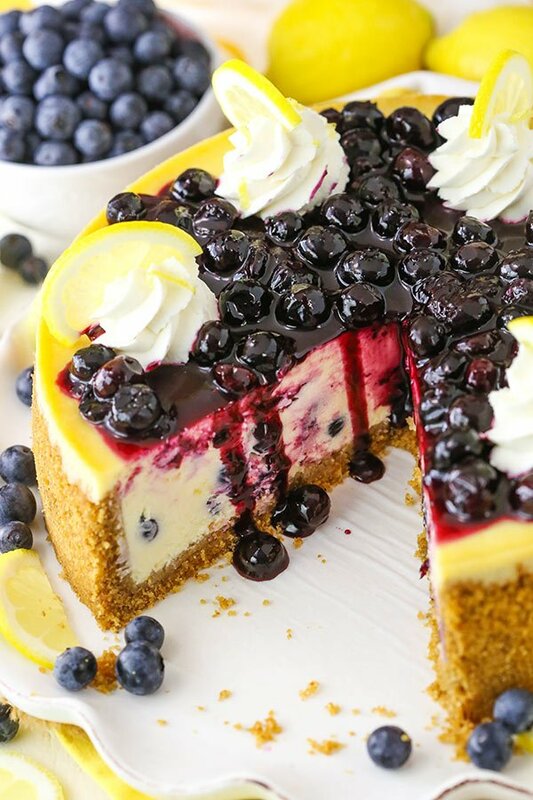 This Lemon Blueberry Cheesecake is thick, creamy and flavored with tangy lemon and blueberries throughout. It sits in a graham cracker crust and is topped with a homemade blueberry sauce. I am a big fan of lemon. Despite the hubs not being a fan, I continue to make lemon dessert after lemon dessert much to his dismay. 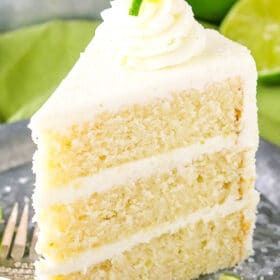 I mean, how can you resist delicious things like this Lemon Cake. You can’t. It wouldn’t be right. And fortunately for me, my mom is a big lemon fan so I share these desserts with her. Cheesecake is also a favorite of mine and with berries in season and so tasty lately, I decided to combine all these tasty things into one great cheesecake. 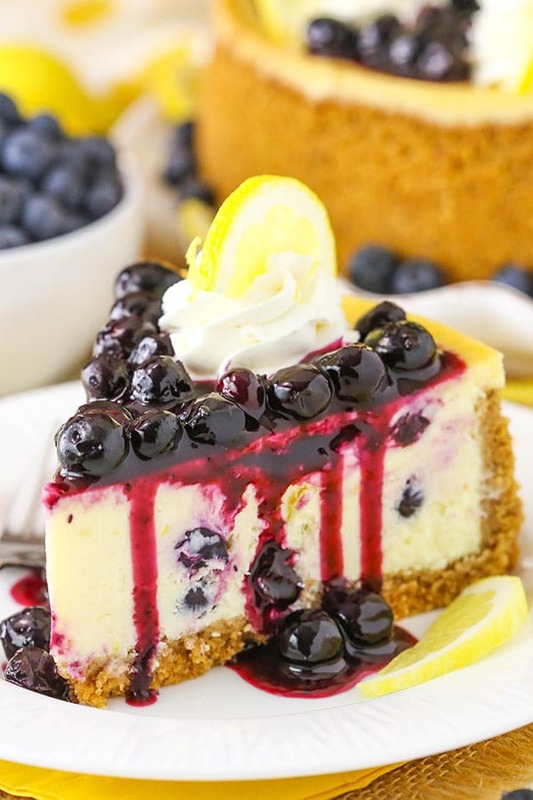 There’s just enough tart and sweet lemon flavor, fresh pops of blueberry in the cheesecake and then it’s all topped with homemade blueberry sauce. Pure heaven! 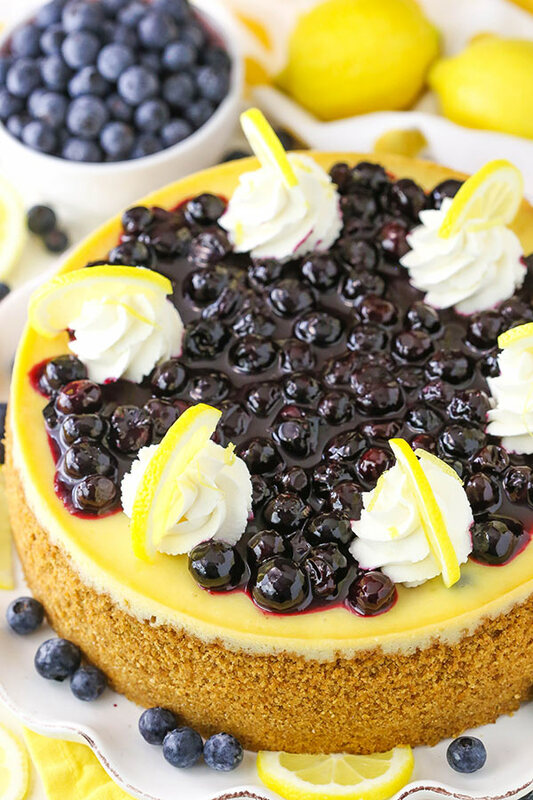 So how would you make a Lemon Blueberry Cheesecake? To start, you’ll make the crust. I went with a classic graham cracker crust this time around and loved it. Combine the graham cracker crumbs, some sugar for sweetness and little butter to hold it all together, then press it into the pan. It bakes for about 8 minutes and then it’s ready to go. Next up is the filling. The lemon base of this Lemon Blueberry Cheesecake is easily my new favorite lemon cheesecake base. If you’ve ever made my lemon curd, you’ll recall that it’s made with egg yolks, no egg whites. I find that this gives a better lemon flavor, so I used that idea in this cheesecake and swapped out one of the whole eggs for egg yolks. It really accentuated the lemon flavor, making this lemon base the best! So to actually make the filling, you’ll start by combining the cream cheese, sugar and flour. The flour adds a little texture to the cheesecake that I love. Next up is the sour cream, lemon juice and zest. All add great flavor to the cheesecake. You’ll then add the eggs, which we’ve discussed, and finally the blueberries. The cheesecake is baked in a water bath, which I’m a firm believer in. Without it, you often get a browned cheesecake that sinks in the middle and has cracks. 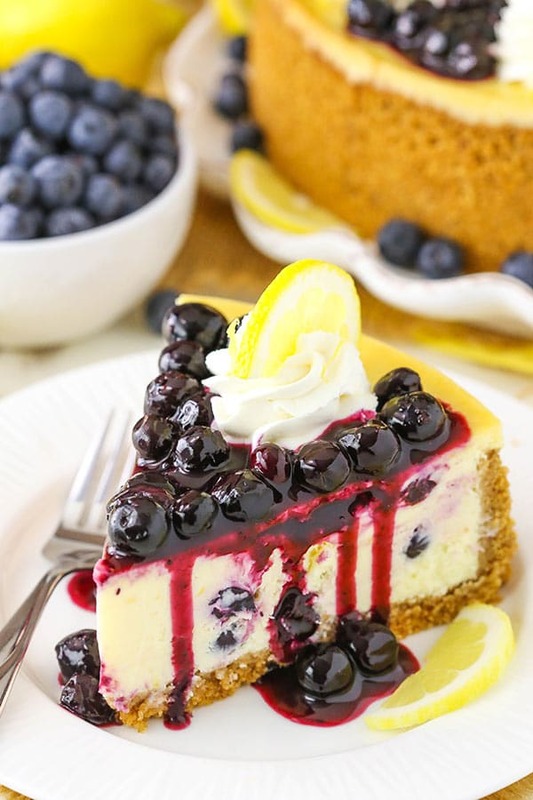 To be fair, this cheesecake can end up with a few small cracks, because of the blueberries that float to the top and create little cracks, but they are small and not noticeable. The whole cheesecake is covered with fresh homemade blueberry sauce. 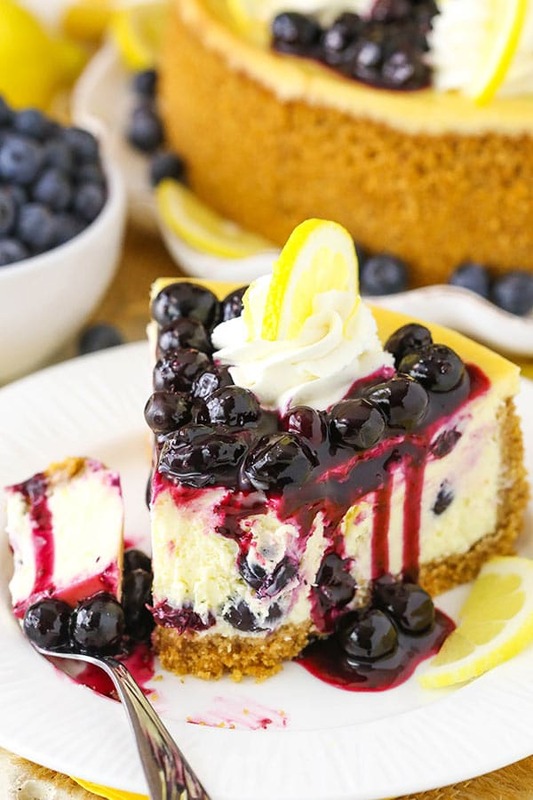 It’s the perfect compliment to the thick and creamy cheesecake and adds just enough additional blueberry flavor to offset the wonderful tang of the lemon cheesecake. With the addition of a little whipped cream and some lemon slices, this cheesecake is ready to go! It’s a classic flavor combination and a cheesecake that really isn’t hard to make, though it takes a little time. The hardest part is waiting for everything to cool so you can dig in! 4. Cover the outsides of the pan with aluminum foil so that water from the water bath cannot get in (see how I prepare my pan for a water bath). Set prepared pan aside. 5. Reduce oven temperature to 300°F (148°C). 6. In a large bowl, beat the cream cheese, sugar and flour on low speed until well completely combined and smooth. Be sure to use low speed to reduce the amount of air added to the batter, which can cause cracks. Scrape down the sides of the bowl. 7. Add the sour cream, lemon juice and lemon zest and mix on low speed until well combined. 8. Add the eggs one at a time, mixing slowly to combine after each addition, then add the egg yolks and mix until combined. Scrape down the sides of the bowl as needed to make sure everything is well combined. 9. Gently stir the blueberries into the batter. 10. Pour the cheesecake batter evenly into the crust. 11. Place the springform pan inside another larger pan. Fill the outside pan with enough warm water to go about halfway up the sides of the springform pan. The water should not go above the top edge of the aluminum foil on the springform pan. 12. Bake for 1 hour 15 minutes. The center should be set, but still jiggly. 13. Turn off the oven and leave the door closed for 30 minutes. The cheesecake will continue to cook, but slowly begin to cool as well. 14. Crack the door of the oven for 30 minutes to allow the cheesecake to continue to cool slowly. This process helps prevent cracking. 15. Remove the cheesecake from the oven and water bath wrapping and place the cheesecake in the refrigerator to cool completely. 16. While the cheesecake cools, make the topping. Combine the sugar, cornstarch and water in a medium-sized saucepan over medium heat and stir to combine. Heat until the mixture is wet and the sugar begins to melt. 17. Add the blueberries and stir to coat with the sugar mixture. 18. Continue to cook until the blueberries start to soften and let out juice. 19. Remove from heat when blueberries are a bit juicy and the juice has begun to thicken. Pour the mixture into another bowl and refrigerate until cool. 20. When you’re ready to serve the cheesecake, make the whipped cream. Add the heavy whipping cream, powdered sugar and vanilla extract to a large mixer bowl and whip on high speed until stiff peaks form. 21. Remove the cheesecake from the fridge and remove the sides of the springform pan. Set the cheesecake on a serving plate. 22. 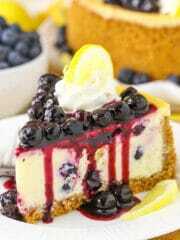 Pipe swirls of whipped cream around the edge of the cheesecake, then top with the blueberry topping and slices of lemon. 23. Refrigerate cheesecake until ready to serve. Cheesecake is best when stored well covered and best eaten within 3-4 days. I imagine that’d be fine. You’ll just want to defrost the berries and pat them dry. This looks gorgeous!! As do all your creations…. so appreciate the pains that go into these labors of love. While I am yet to make it, I wanted to compliment you on a number of other recipes that I have tried from here – each one has been an outstanding success. Thank you for bringing such visually beautiful deliciousness to our lives. Thanks so much Priya! I’m glad you’ve enjoyed everything! Can I use unsalted butter for the crust? If so how much salt should I add? I tried this cheesecake based on success from other cheesecake recipes posted by lifeloveandsugar.com. I was not disappointed! The directions are easy to follow–the results were amazing. I also used the same batter with mini cheesecakes. You have to adjust the baking time but by watching carefully I achieved a perfect product–crust only on the bottoms, not up sides. I’m guessing you could use cupcake papers but I have several tiny cheesecake pans that I used. Kathy, how long did you bake the mini ones for? And how mini were they? Size of muffin cups? Would love to make smaller ones! Hi, Lindsay! I made this wonderful refreshing cheesecake yesterday. Awesome! Without a doubt, one of my new favorites! The family is coming for dinner tonight and I’ll share a piece with them, but just one piece ! Yes, they should be fine as minis. Made this for my birthday cake. Delicious. Definitely a keeper. And easy to make. Lemon and blueberry is one of my favorite food combos. So bright and fresh! This cheesecake looks AMAZING! I’ve never used canned blueberries. Do they come in a syrup? I might try frozen blueberries and thaw them out. Wow. I’ve had different cheesecakes all over the world. I made this for Thanksgiving day dessert and everyone was blown away at how insanely good it turned out. After having this every cheesecake I’ve had in the past seems like child play. Thanks for this! I made it exactly as stated, but with the Whole Earth (stevia + erythritol) sweetener as I’m off processed sugar. Though I had to settle with the sugar in the biscuits. It turned out fantastic! My blueberry sauce was a bit thin, so that’s something I’d like to fix next time, but that could be because I used frozen blueberries for the whole thing. Overall, great recipe. One I’ll be making again for sure. That’s so awesome to hear! I’m glad the tutorial was helpful and you enjoyed the cheesecake! Wow, never had so many positive comments for my cooking! Ever! Was the star of the show, and everyone wanted a piece! 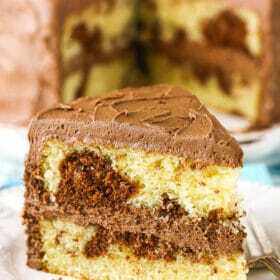 Easy to make, and turned out moist and creamy! Absolutely brilliant! Thanks for this fantastic recipe! It was very delicious. I made two batches using the same foundation, but made both blueberry lemon and raspberry lemon. I want to show you what I made and would like to upload photos for you to see. Fantastic cheesecake! Just the right amount of lemon. I swirled the blueberry sauce into the cheesecake before cooking, and omitted the blueberries called for in the batter. It turned out great. Thanks for the awesome recipe. The flavor was excellent but it was very undercooked, even after I left it baking for 1:50, along with the 2 30 min cooldown times (at 5,000 feet elevation if that matters). Is there another way to check for doneness? Temperature reading? Hummm, I’m not really familiar with high altitude baking, I’m sorry. It looks yummy. Can I just baked without water bath?? You could, but it could possibly crack, fall in the center when cooling and brown around the edges. Just depends on the look you prefer. It looks yummy. Can I just baked without water bath? I made it , it is the best cheese cake. I substitute the crust for almond crust and substitute sugar by diet sugar and it is perfect keto cheescake. Thanks . Should I adjust the baking time if I am going to use an 8-inch springfoam pan? Also if I am going to cut the recipe in half and use a 4-inch springfoam pan? Thank you! Yes, it’ll be a thicker cheesecake in an 8 inch pan (and I’m not sure it’ll all fit). But if it does, you’d want to increase the baking time. I haven’t ever made a 4 inch so I’m not sure about adjustments for that one. I am going to try and make this for an upcoming gathering. However, one of my friends is gluten intolerant. Is it possible to make this without adding the flour to the cheesecake batter? If so, what adjustments will be needed? Thanks in advance! That should be fine. You could just leave it out or add about 1 1/2 tbsp of cornstarch. Looks amazing! How long should the cheesecake chill before adding the blueberry topping? And how long can the topping sit on the cheesecake before serving? I’d let it chill for at least a few hours so it firms up a bit. The topping should be ok for several hours. You just don’t want it to dry out. So, Ive used this recipe a few times already and it is a great one. I made an adjustment to the crust though. Nilla now makes Lemon wafer cookies and I started using those for the crust to impart some additional lemon flavor. Everyone raves about this cheesecake now. Do you happen to have instructions for making in an instant pot? I’m dying to try it!